My Wing Chun Sifu, Sifu Pham, invited me to play a role in his latest Kung Fu commercial shoot. With so many amazing martial artists on set, it was an incredible and humbling opportunity to be involved! The full length commercial will be out soon, and will be online in America, and air on TV in Hong Kong, India, and Vietnam. 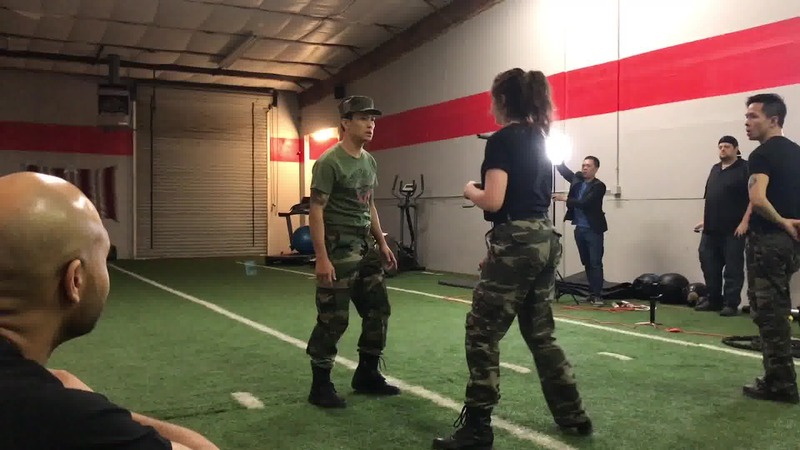 In this fight scene, I fight Sifu Pham using Taekwondo techniques. Taekwondo is my specialty, because it is my base martial art. I am a second degree recommended black belt in Taekwondo, but I still have such a long way to go! Now, along with my continued Taekwondo training with my Taekwondo instructor, I train Wing Chun with my Sifu, but in this scene, he decided he would like to showcase some of our Taekwondo kicks for the camera! Our sequence was quite simple. I prepare with my ready stance, then throw a back leg crescent kick another crescent kick, and land with a cross, jab, back hand hook, and finally a lead hand haymaker. Of course, Sifu blocks all of my strikes with ease, and pushes me out of the way with a Tai Chi flow movement. I have been training my arms with my other Wing Chun instructor, as well as on my wooden dummy, to harden them and prevent bruising. I have not been bruising anymore lately, but when I threw my strikes at Sifu, I realized just how dense his arms are! He has done so much body hardening that his bones are extremely dense and heavy, and it actually feels like he is blocking with iron beams wrapped in skin. It’s incredible! I can’t wait to further my Wing Chun Kung Fu training. If anyone is interested in hiring Sifu and his production crew for a commercial production shoot, contact me!